Accessory kits provide Plasma welding consuable parts for popular Thermal Dynamics PWH/M 2A, 3A, 4A and PWM-300, on hand when you need them. Arc-Zone's Pro Accessory Kits allow you to choose the parts that best suit your welding application. Once the torch is dialed-in, only re-order the parts you need to keep your torch up and running. 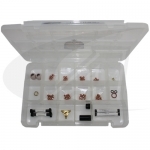 Pro Kits include parts for multiple torch set-up options, amperage ranges. 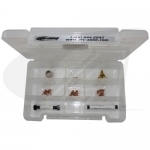 etc., with a variety of back caps, constricting tips, tungsten electrodes, gas distributors, shield cups, liners, o-rings and more!